Networked appliances, lights, heating and air conditioning units that regulate automatically through sensors. Remote management of routine tasks such as watering flowers or operating the blinds, alarm systems that alert you via phone or . Home automation is the science that deals with the study of technologies to improve the quality of life at home and more generally in the environment inhabited by humans. 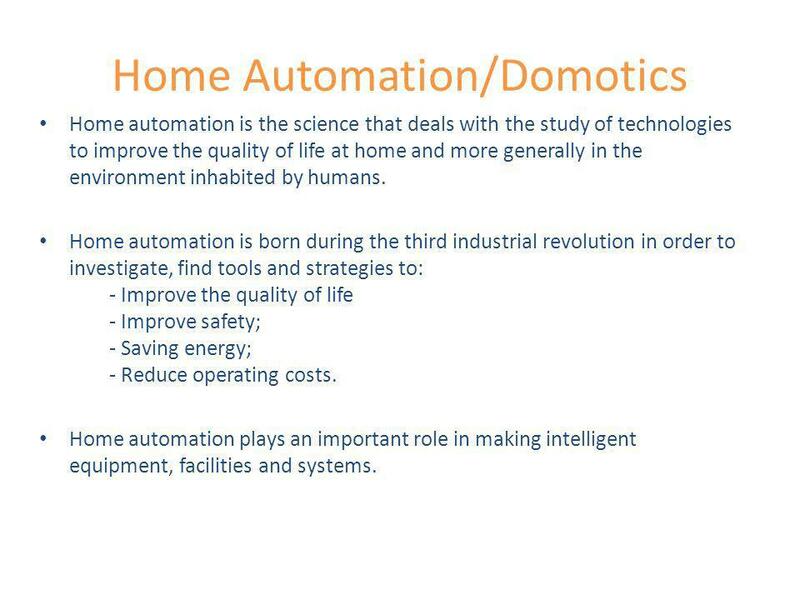 Home automation is born during the third industrial revolution in order to investigate, find tools and strategies to: - Improve the quality of life - Improve safety; - Saving energy; - Reduce operating costs. 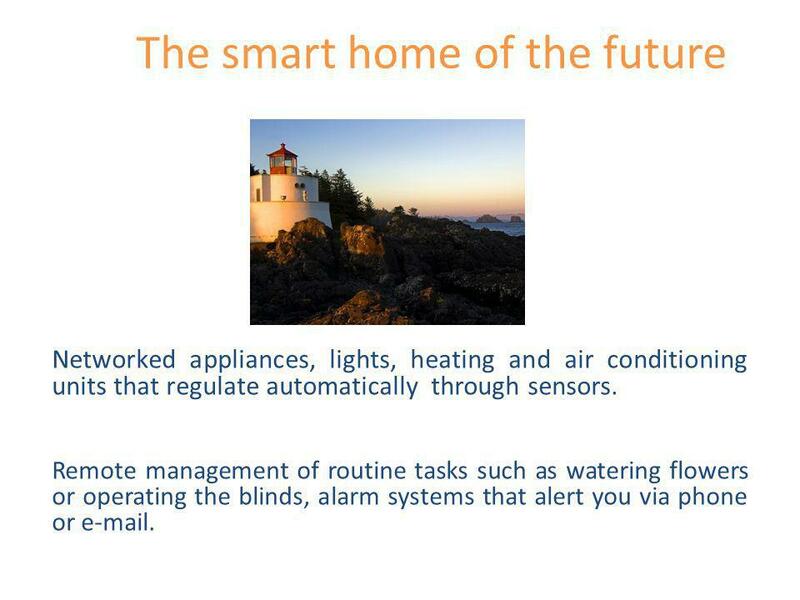 Home automation plays an important role in making intelligent equipment, facilities and systems. 3 How will it be managed? 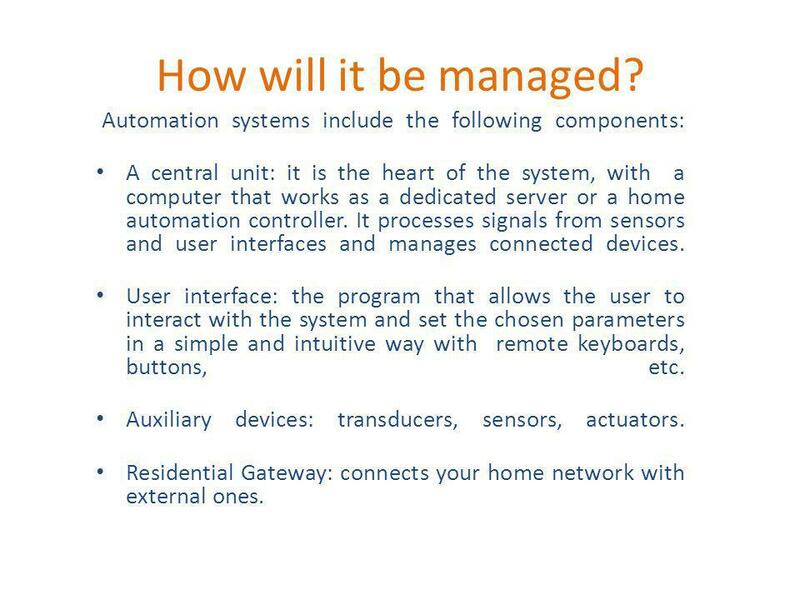 Automation systems include the following components: A central unit: it is the heart of the system, with a computer that works as a dedicated server or a home automation controller. It processes signals from sensors and user interfaces and manages connected devices. User interface: the program that allows the user to interact with the system and set the chosen parameters in a simple and intuitive way with remote keyboards, buttons, etc. Auxiliary devices: transducers, sensors, actuators. Residential Gateway: connects your home network with external ones. 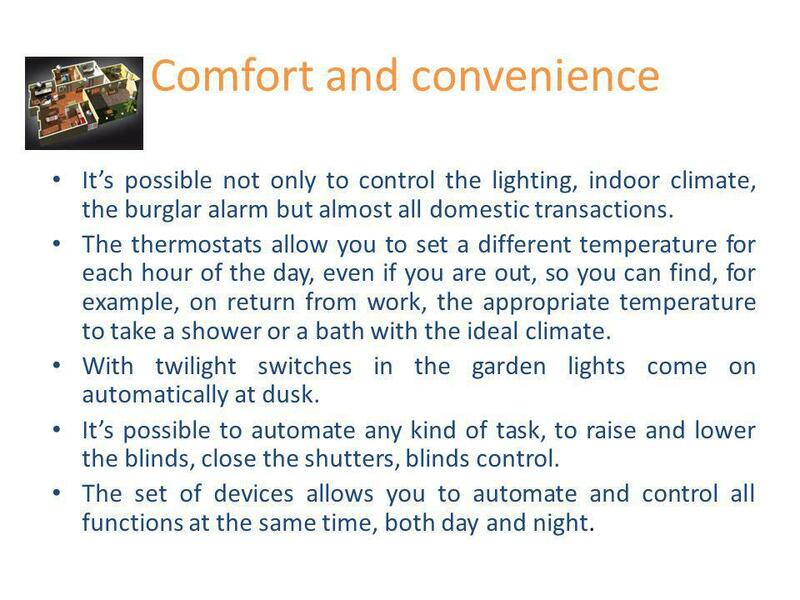 It’s possible not only to control the lighting, indoor climate, the burglar alarm but almost all domestic transactions. The thermostats allow you to set a different temperature for each hour of the day, even if you are out, so you can find, for example, on return from work, the appropriate temperature to take a shower or a bath with the ideal climate. With twilight switches in the garden lights come on automatically at dusk. It’s possible to automate any kind of task, to raise and lower the blinds, close the shutters, blinds control. The set of devices allows you to automate and control all functions at the same time, both day and night. 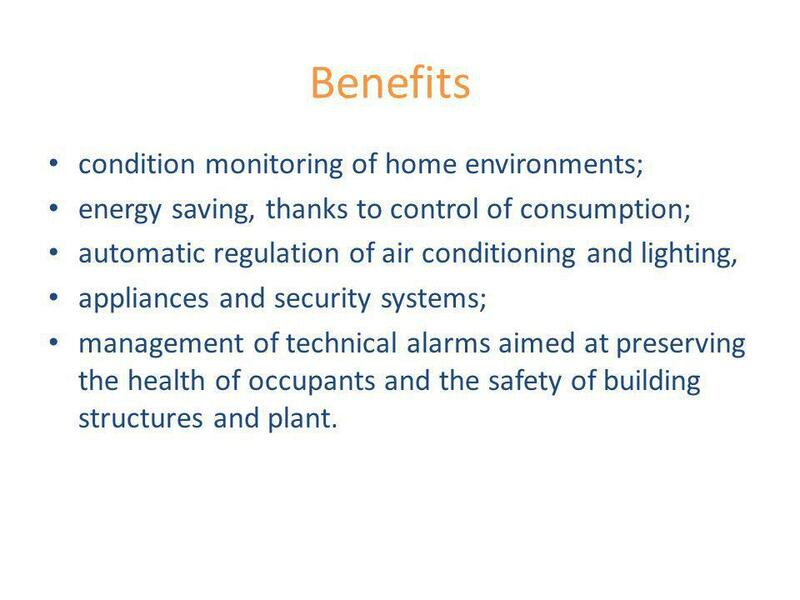 energy saving, thanks to control of consumption; automatic regulation of air conditioning and lighting, appliances and security systems; management of technical alarms aimed at preserving the health of occupants and the safety of building structures and plant. Develop technologies that are actually usable, to allow the elderly to lead an independent and comfortable life as much as possible, avoiding isolation and encouraging socialization. This is what is called "active longevity", which means not only thinking in terms of medical treatment but also of the promotion of lifestyles adapted to make the best of the third and fourth ages. 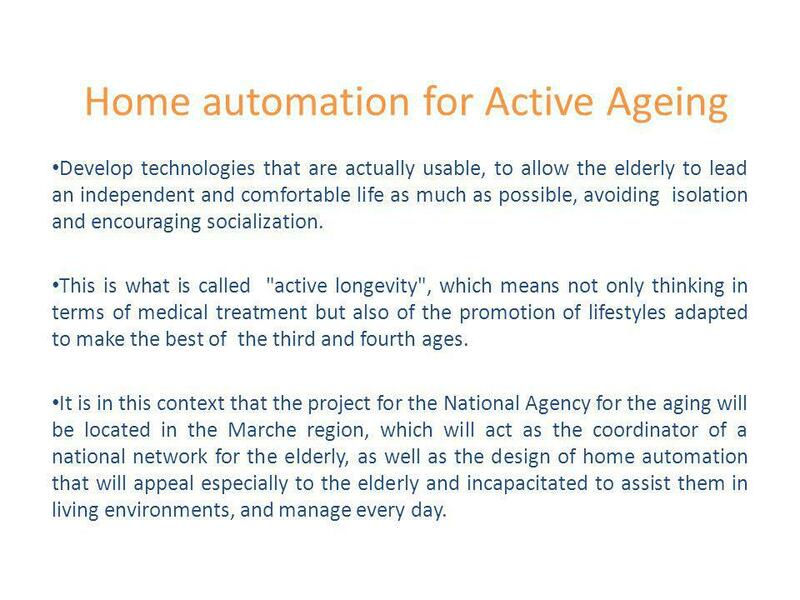 It is in this context that the project for the National Agency for the aging will be located in the Marche region, which will act as the coordinator of a national network for the elderly, as well as the design of home automation that will appeal especially to the elderly and incapacitated to assist them in living environments, and manage every day. 7 Who are we? 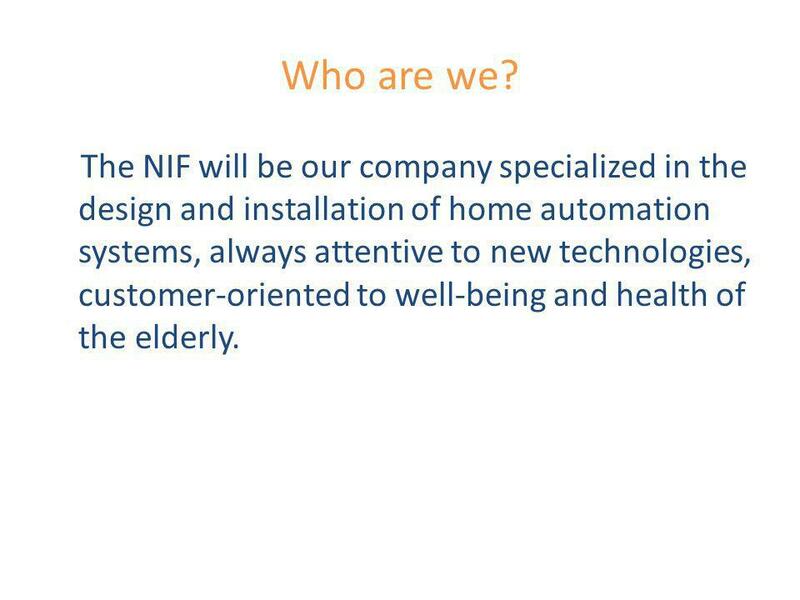 The NIF will be our company specialized in the design and installation of home automation systems, always attentive to new technologies, customer-oriented to well-being and health of the elderly. Download ppt "The smart home of the future"
Symphony: a digital home integrated platform Alessandro Martucci, Nextworks ICT for Sustainable Homes, Nov , Nice Innovative products and services. Nano-10 based Building Automation System (BAS) Jesús BaezMarch, 2011. Design for the Elderly and Disabled Environments: Making Homes More Comfortable and Accessible Controls and Signals Part 10 of 10. Energy efficiency gains through Schneider Electric lighting control Speaker : Michael Lam, Control Systems APOD, Installation Systems and Controls, Schneider. SSIA SUMMIT October 2014 Advanced Bridging Technologies Hold Key to Finally Making Smart Homes a Reality Fred Dart – FTDI Chip. Constellation Heating and Cooling Building Automation Systems. |TELETASK for Architects1 Domotics = Integration Domotics integrates the different functions of a house Raising: Comfort Security Energy Management. We help the best buildings in the world get that way. Complete Building Solutions. Lighting Automation LLC Lighting Automation Smart Lighting Systems. Smart Home Solutions. Visit us at Hasibat Information Technologies Co. K.S.C.C.